I’m the world’s worst when it comes to lunches, I often forget to eat lunch, and then find by mid afternoon I’m hungry and go foraging for carbs, which my body really doesn’t like! In a bid to end that habit, I stocked up the fridge with lots of colourful vegetables to snack on, and thought I’d experiment with low fat Greek yoghurt to make some dips for my crudités. 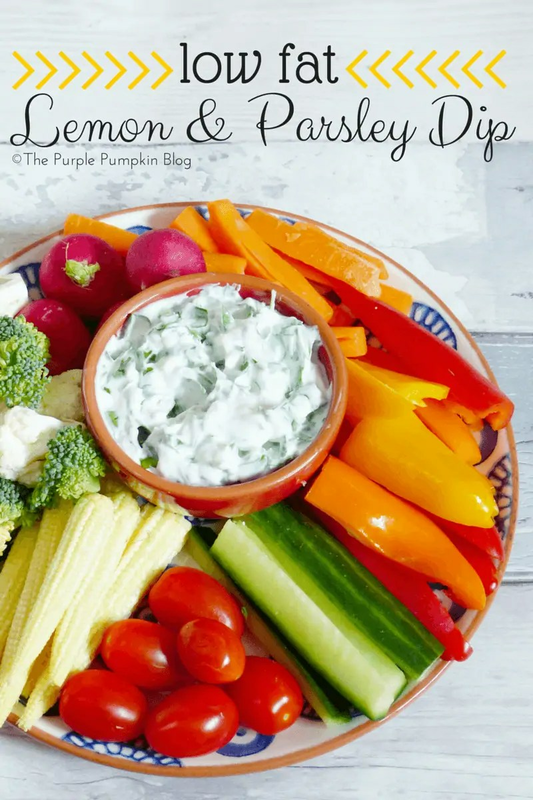 The first one I’m sharing is a low fat lemon and parsley dip, which is so easy to make and tastes delicious! Make this dip to taste! Serve with a selection of your favourite vegetables for a healthy low fat snack. Place the yoghurt into a bowl and flavour with lemon juice and salt (or garlic salt if you prefer) to your taste. Stir in the parsley. Serve with a selection of cut vegetables. Serve with chopped veggies – carrots, bell peppers, cherry tomatoes, cucumber, baby corn, broccoli, cauliflower and radish – or whichever are your favourites.